POUGHKEEPSIE, N.Y.—Tucked away in his office on Vassar College’s quiet campus, John Long prepares to bring his simplest robot to life. Long places a wooden box containing a small wire circuit on the table and adjusts the cuffs of his navy wool sweater. Outside, December snow piles up against Long’s wide window, which overlooks Vassar’s century-old archways. Inside, the small machine begins to whir into life. As Long flashes light from his iPhone onto a small sensor, a toy fish affixed to the wires flaps its tail back and forth — turning in and away from the light with small and steady kicks. This circuit is the simplest example of what Long does: build robots to understand how species evolved. And though Long descends from a family of Nantucket whalers (a self-confessed dark family secret, considering his love for fish), that doesn’t stop him from trying to reconstruct extinct fish. Long’s robots — which he’s fondly named Madeleine, Tadro and the Nerds — share the same mechanistic features as extinct fish, like having flexible vertebrae. They also have light sensors in the place of eyes so they can receive sensory input. So when Long places the robots in different scenarios inside a tank — like a predator chasing a prey — he can observe how those particular fish and their bodies might react. Through robots, Long can zoom in on the parts of evolution he wants to examine closely. “Robots are a way of simplifying and stripping down so you can understand organisms better,” he explains. Long’s robots are located in his Vassar College lab, its door marked by a hand-drawn sign by his daughter that reads “The Abyss.” “The Abyss is the part of the ocean where there is no light, but it’s also my daughter’s reference to Doctor Who,” Long says as he opens the door, revealing a room of painted black walls and a single spotlight. The spotlight hovers over a large round tank occupying half the room. A sliver of winter light falls on the rubber tails and plastic flappers that hang from hooks on the walls. Here, Long conducts what he calls “evolutionary Olympics” — a game of survival between two Tadros robots. The name Tadro is short for tadpole robots. Each Tadro is a Tupperware container with two light sensors on either side of its head for eyes. The Tadro’s most important feature is its backbone and tail, which Long has designed to mimic the flexible vertebrae of fish. Each Tadro has a varying number of vertebrae and a different size tail. During evolutionary Olympics, Long places two Tadros in a tank — one a predator and the other a prey. The predator’s only job is to catch the prey, while the prey is the main test subject. Will the physical characteristics of that particular model of prey help it survive so it can reproduce? “It’s like ‘The Hunger Games,’” says Long. “You have individuals coming from different places to compete. Fish also have different numbers of vertebrae, different size tails, different vulnerability to predators.” The prey emits a small light signal, which the predator can sense if it gets close enough. From these experiments, Long records what models of prey survived the longest. He then finds out what physical characteristics about this model allowed it to survive, and from there, creates new models of fish based on those successful characteristics. 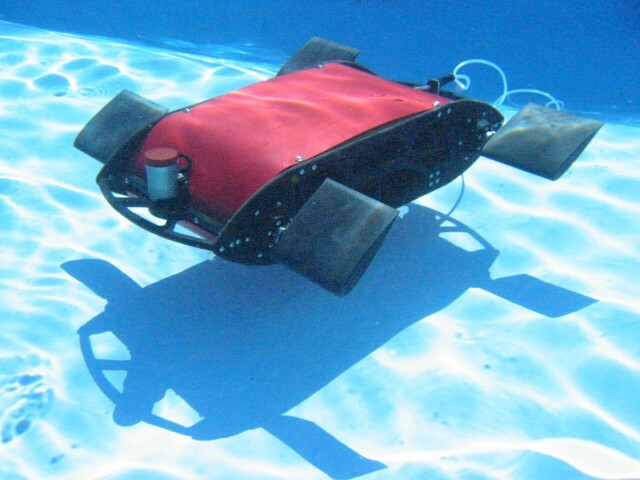 Long essentially “evolves” the robotic fish. He describes his robots not as exact replicas of early fish, but as “purposeful simplifications of life.” They give information about the essential abilities that allowed fish to behave and evolve. From these predator and prey studies, Long guesses fish might have developed more vertebrae in order to swim away from predators faster and keep closer to feeding sources. Long’s robots have garnered the attention of the U.S. Navy, which funded his work in the 1990s. As his book says, the navy was interested in “defense-related, bio-inspired robots.” But once the Office of Naval Research asked Long and his colleagues to explicitly write that their work will make “better weapons-delivery platforms” in their research proposals, Long wanted out. He did not want to contribute to war. Back in the Abyss, Long’s research goals seem much simpler. Night has settled over Vassar’s campus, now blanketed by glittering snow. Long takes down a red rubber flipper hanging from the laboratory wall. He looks at it and touches its rubber flaps. “This was Madeleine’s flipper,” he says. “She’s on the road now, far from home.” Madeleine is the most famous of his robots. A four-flippered robot built to replicate giant prehistoric marine reptiles like the Loch Ness monster, she is currently on exhibit at the Field Museum in Chicago. Madeleine hangs on the museum wall since she’s currently broken — the inevitable fate for a robot. “She’s a shell of her former self,” he says, hanging his head. Nevertheless, Madeleine is yet another example of Long’s curiosity to re-imagine extinct species.